signed and on verso signed, titled A Surrealitic [sic] Lady and A Surrealistic Lady on the Dominion Gallery label, dated 1964 and inscribed "Vence A.M. France"
Jean-Philippe Dallaire's exposure to Cubist and Surrealist works in pre-war Paris was clearly very significant to his artistic development. It should be noted, however, that among the various influences on this artist, none was more important than that of the French painter and tapestry designer Jean Lurçat (1892 - 1966), under whom Dallaire apprenticed at Aubusson in 1949. 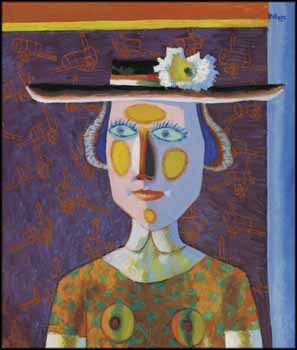 In common with so many of his delightful images, A Surrealistic Lady catches us off guard: we are struck by the immediacy of the intense and unconventional colour, the piquant simplification of the lady's facial and bodily features...and that hat! The backdrop, too, is reminiscent of the mille-fleurs decorative elements in tapestry, even though the design motif is a steam boiler on a wheeled cart, an object that appears in several other works by the artist. Surely such an unconventional image could only have been produced by an artist of great wit, playfulness and with an unabashed confidence in his personal interpretation of the society in which he lived. We are reminded once again of Dallaire's unique place in the pantheon of great Canadian artists.